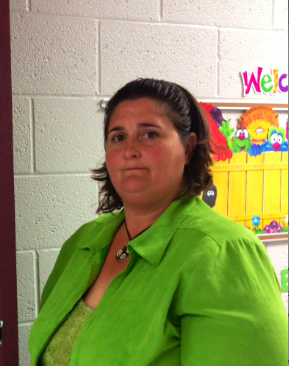 Danni Legg transferred her two kids to Kelley Elementary this past August. She moved them from Plaza Towers Elementary, after the tornado in May destroyed the school, causing the death of her middle child, Christopher, along with six other students. Legg says returning to Moore after the tragedy was something she did for her children. Danni Legg transferred her children to Kelley Elementary in Moore, the only elementary school in the district with a safe area for tornadoes. "I wanted my children to understand the town didn't kill their brother," Legg said. "A tornado and the lack of good construction in the building is what killed their brother." Coming back to town, Legg was surprised to discover that Kelley was one of just two schools in the Moore district that had safe rooms for disasters. Kelley was also the only elementary school. "I was under the assumption that there would be more schools to select from," Legg said. "They weren't going to school if there wasn't a structure in it, flat out." The problem extends beyond just Moore. 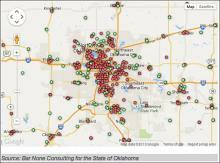 State Representative Joe Dorman from Rush Springs recently commissioned a marketing firm to investigate exactly how many schools in the state have shelters. Mark Nestlen of Bar None Consulting prepared the study and says the findings are better than expected. "Six hundred ninety-five schools in the state have some type of a safe area according to the way they have described it," Nestle said. "That means that there’s 38.5% of the schools that have something that they consider to be a safe area where they send their students and their staff in the case of a tornado scenario or bad weather." But not all of those schools have shelters approved by FEMA to withstand the 245 mile-per-hour winds of E.F. 5 tornados, like the ones that swept through Central Oklahoma back in May. In fact, only 15% of all schools statewide meet that criterion. That leaves over 500,000 teachers, students and staff without adequate protection if a similar storm hits. Moore Public Schools Superintendent Robert Romines recognizes that the city’s two sheltered schools may seem like a small number. "A lot of times people will say, 'Why do you only have two buildings with safe rooms?'" Romines said. "Reason being is because, typically in the state of Oklahoma or at least here in Moore in our community, we didn't deal with storms during the school day. It was night and early evening hours after students got home." But the tornado in May made it clear that that isn’t always the case, so Romines and district officials would like the number of shelters to increase. "Our goal is in all new construction, whether it be through a bond issue or whatever the case might be, we will incorporate some type of a safe hallway or structure in new construction," Romines said. Including a shelter with new construction adds only about 15% to the total building expense, so it’s pretty cost effective. On the other hand, trying to retrofit an existing school with a FEMA-approved shelter could cost 3-times that amount. Voters in Moore recently passed a bond issue to add pre-k additions to five existing elementary locations. Romines says the district is considering incorporating shelters into the building plans. "That right there takes care of five of our elementary sites," Romines said. "We don't have to go back and retrofit. We'll do that within new construction." But the district has 23 elementary schools overall, so thousands of students could still be vulnerable to future severe storms. Danni Legg says she will continue to encourage building shelters in schools despite the cost. 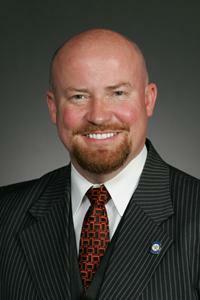 "We're fighting for everybody else out there in Oklahoma to make places safe for their kids to be at," Legg said. "The government requires our children to attend school by law. They need to keep our kids safe." She’s heartened by the fact that the two schools that were destroyed on May 20th – Plaza Towers and Briarwood Elementary – will be rebuilt with safe areas. Both are expected to re-open by next August. But according to Governor Fallin, adding a safe room or shelter to every school across the state could cost up to $2 billion. The results of a statewide survey released Thursday show 62 percent of Oklahoma’s 1,804 public schools don’t have storm shelters, and only 15 percent have shelters built to withstand the 250 mph winds of an EF5 tornado, like the ones that swept through central Oklahoma in May 2013. Organizers have launched a signature-gathering campaign for a $500 million bond issue to put storm shelters in public schools. The group Take Shelter Oklahoma filed a petition on Wednesday with the Oklahoma Secretary of State's office to get the issue on a statewide ballot. Once the ballot language is given final approval by the attorney general, supporters have 90 days to gather about 155,000 signatures of registered voters. The plan calls for the debt service on the bond issue to be paid by the annual franchise tax levied on businesses.